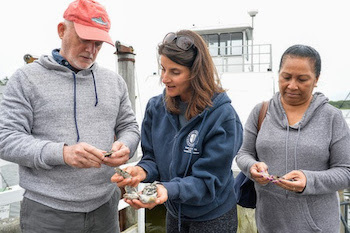 On July 9, the Institute for Ocean Conservation Science at the Stony Brook Southampton Marine Station welcomed a group of United Nations ambassadors, dignitaries, and their families for a tour of the facility and an overview of the Shinnecock Bay Restoration Program. Ten countries, including Antigua & Barbuda, The Bahamas, Fiji, Israel, Italy, Kiribati, Palau, Papua New Guinea, Poland, and Vanuatu, were represented on the tour. President-Elect of the United Nations General Assembly Ambassador Peter Thomson of Fiji was among the representatives, and he noted to attendees that the sediment in Shinnecock Bay looks, smells and feels just the same as the bay bottom he remembers as a child in Fiji. He cited Stony Brook University’s restoration program as a model for protecting marine areas to safeguard oceans and coastal areas for generations to come. 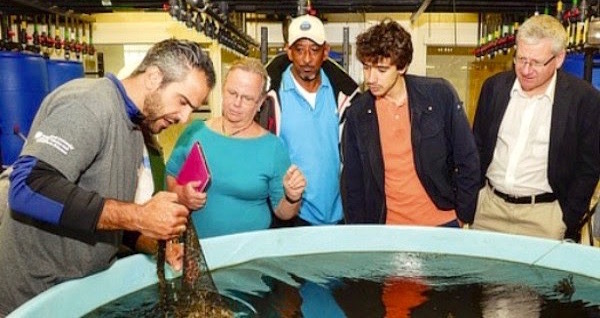 The nations that participated in the tour are part of the 10 x 20 Initiative, aimed at protecting 10 percent of the world’s oceans by the year 2020. This target is included in the U.N.’s Sustainable Development Goals, adopted by U.N. member states in September of 2015. The Institute for Ocean Conservation Science’s Executive Director, Dr. Ellen Pikitch, and Assistant Director for Policy and Outreach Christine Santora are involved in the 10 x 20 Initiative through their work with the Ocean Sanctuary Alliance. In March 2016, diplomats involved in the 10 x 20 Initiative gathered in Rome, along with scientists led by Dr. Pikitch, to create the Rome Call to Action — a statement calling for more and robust use of Marine Protection Areas, like the shellfish spawner sanctuaries around the East End’s waters. The 10 x 20 Initiative is chaired by Italy, with Vice-Chairs from The Bahamas, Palau, Poland, Kenya and the OSA. During the tour at the Southampton campus, laboratory director Christopher Paparo and ShiRP PhD student Andrew Griffith discussed current experiments, shellfish spawning, and how the scientific work done in the lab directly informs bay restoration with the diplomats, who also heard an overview of ShiRP’s restoration goals and activities from ShiRP’s program manager Christine Santora and Stony Brook University research scientist Dr. Konstantine Rountos, who has led ShiRP’s trawl survey and other fishery-related activities since the program’s inception. A highlight of the study tour was a visit to the hard clam spawner sanctuaries in Shinnecock Bay — areas where large numbers of adult hard clams have been placed in close proximity to one another to maximize population growth and reproduction. Spawner sanctuaries, a type of marine protected area, are a conservation tool that can improve the water quality and shellfish populations of Shinnecock Bay. 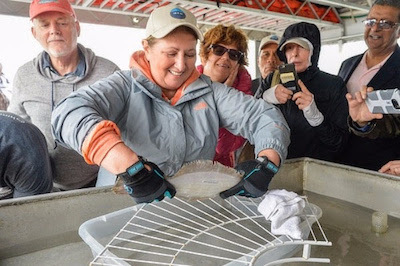 During the outing on the R/V Peconic, the success of the sanctuaries became apparent when samples taken just outside the protected area revealed small hard clams – offspring of the adult clams that had been placed in the hard clam sanctuaries. Diplomats also helped deploy sampling gear, which revealed some of the fish and invertebrates resident in Shinnecock Bay, and learned how various species and habitats contribute to the bay’s ecological health and vibrancy. The group also tagged a summer flounder with an acoustic transmitter that allows ShiRP researchers to monitor migration patterns of this flagship fish species.